The life of our national hero Gjergj Kastrioti - Skenderbeu. He was an Albanian nobleman and military commander. He was born in 1405 and died in 1468. So the times we are talking about are after the end of medieval times. As a child, member of the noble Kastrioti family, he was kidnapped/forced to the Ottoman court, where he was educated and entered the service of the Ottoman sultan for the next twenty years. He rose through the ranks, culminating in the appointment as sanjakbey (governor) of the Sanjak of Dibra in 1440. In 1443, he deserted the Ottomans during the Battle of Niš and became the ruler of Krujë, Svetigrad, and Modrič. In 1444, he was appointed the chief commander of the short-lived League of Lezhë that consolidated nobility throughout what is today Albania. 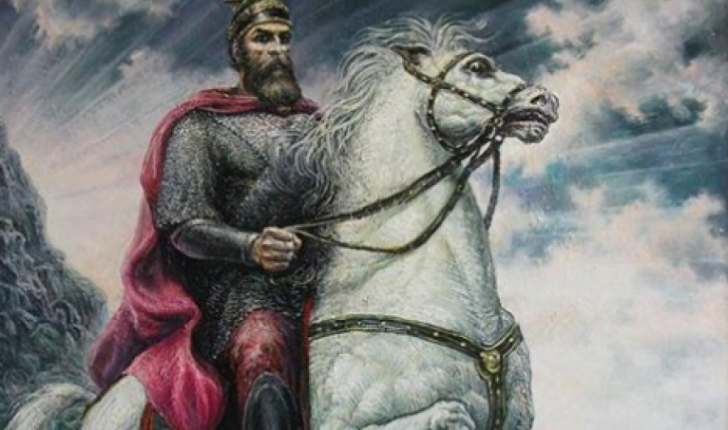 His followers included, apart from Albanians, also Slavs, Vlachs, and Greeks.For 25 years, from 1443 to 1468, Skanderbeg’s 10,000 man army marched through Ottoman territory winning against consistently larger and better supplied Ottoman forces, for which he was admired. In 1460–61, he participated in Italy’s civil wars in support of Ferdinand I of Naples. In 1463, he became the chief commander of the crusading forces of Pope Pius II, but the Pope died while the armies were still gathering. Together with Venetians he fought against the Ottomans during the Ottoman–Venetian War (1463–79) until his death in January 1468. The 1st one was set from 14 May until 23 November 1450. The Albanian Army (called The Conjuction of Lezha) had 8,000 soliders where as the Ottoman Army had 100,000-160,000 soliders. The battle was won by the Albanian Army and after that the Ottoman campes around Lezha were attacked as well as a caravan of supplies of the Ottoman army of Sultan Murat II. The 2nd one was set from 1466 until 1467. Albanian army soliders: 12,400; Ottoman army soldiers: 150,000. This was also won by the Albanian Army. The 3rd one was set from 1467 until ?. This time the Ottoman Empire had sent troops from all around the neighbor countries( Bosnja, Serbia, Macedonia, Kosovo, and Greece). It was said that the Ottoman army were larger in numbers and were more organized then the previous battles. Still, the Albanian army held the town and forced the Ottoman army out. The 4rth one was set from 1476 until 1478(after the death of Skenderbeu). Demoralized, weak and starving from the previous battles, the Albanian army was broken by the Ottoman forces and the town of Kruja was occupied by the Ottoman Empire. Sultan Mehmet II promised to spare the Albanian civils, but instead broke the promise by killing men, enslaving women and children and forcing young girls into marriage. I remember reading about these battles when I was a child and they were really epic and beautifully written. Skanderbeg’s struggle against the Ottomans became highly significant to the Albanian people. It strengthened their solidarity, made them more conscious of their identity, and was a source of inspiration in their struggle for national unity, freedom, and independence.Contemporary Muslim Albanians deemphasize the (Christian) religious heritage of Skanderbeg by viewing him as a defender of the nation and he is promoted as an Albanian symbol of Europe and the West. The trouble Skanderbeg gave the Ottoman Empire’s military forces was such that when the Ottomans found the grave of Skanderbeg in the church of St. Nicholas in Lezhë, they opened it and made amulets of his bones, believing that these would confer bravery on the wearer. Indeed, the damage inflicted to the Ottoman Army was such that Skanderbeg is said to have slain three thousand Ottomans with his own hand during his campaigns. Among stories told about him was that he never slept more than five hours at night and could cut two men asunder with a single stroke of his scimitar, cut through iron helmets, kill a wild boar with a single stroke, and cleave the head of a buffalo with another. James Wolfe, commander of the British forces at Quebec, spoke of Skanderbeg as a commander who “excels all the officers, ancient and modern, in the conduct of a small defensive army”. On October 27, 2005, the United States Congress issued a resolution “honoring the 600th anniversary of the birth of Gjergj Kastrioti (Scanderbeg), statesman, diplomat, and military genius, for his role in saving Western Europe from Ottoman occupation.” Fully understanding the importance of the hero to the Albanians, Nazi Germany formed the 21st Waffen Mountain Division of the SS Skanderbeg (1st Albanian) in 1944, composed of 6,491 Kosovo Albanian recruits. Now imagine your turn his story in a video game with epic soundtrack, awesome combat with a medieval theme. It would be absolutely epic!